What leading educators and education policy leaders are saying about Disrupting Class. "A brilliant teacher, Christensen brings clarity to a muddled and chaotic world of education. "After a barrage of business books that purport to 'fix' American education, at last a book that speaks thoughtfully and imaginatively about what genuinely individualized education can be like and how to bring it about." "A decade ago, Clayton Christensen wrote a masterpiece, The Innovator's Dilemma, that transformed the way business looks at innovation. Now, he and two collaborators, Michael Horn and Curtis Johnson, have come up with another, which focuses his groundbreaking theories of disruptive innovation on education." "Clayton Christensen's insights just might shake many of us in education out of our complacency and into a long needed disruptive discourse about really fixing our schools." "Full of strategies that are both bold and doable, this brilliant and seminal book shows how we can utilize technology to customize learning. I recommend it most enthusiastically." "Finally we have a book from the business community that gets it. A must read for anyone thinking and worrying about where education should be headed." "Students currently enjoy powerful technology that continuously assesses skill and interest and customizes content delivery. Unfortunately it occurs after school when they play games. Clayton Christensen and colleagues describe how disruptive technologies will personalize and, as a result, revolutionize learning. Every education leader should read this book, set aside their next staff meeting to discuss it, and figure out how than can be part of the improvement wave to come." 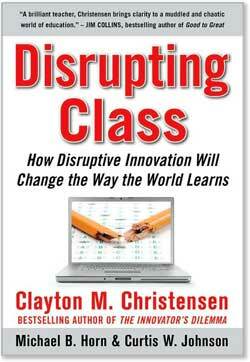 "In Disrupting Class, Clay Christensen brings to K-12 education the powerful concept of 'disruptive innovation' that has radically reshaped thinking about private sector innovation and business change. He considers the glancing impact that technology has had on classrooms, explains why this is so, and what it will take to reengineer our nation's schools for the 21st century. Brushing aside bromides and familiar solutions, he offers a piercing look at the profound changes in organization, staffing, and instruction if schools are truly to educate each child in accord with their needs and an eye to their potential." "American school districts are pressed by policymakers demanding achievement, by students wanting relevant learning, by teachers looking for a professionally rewarding career, and by taxpayers hoping for some improvement in productivity. If they are to respond successfully to these challenges, the path Clayton Christensen maps out will be the way." "In Disrupting Class, Christensen, Horn and Johnson argue that the next round of innovation in school reform will involve learning software. While schools have resisted integrating technology for instruction, today's students are embracing technology in their everyday lies. As the authors argue, schools have steadily improved through the 1970s. The question is whether the next innovation, truly individualized instruction, will occur inside or outside public education. This book offers promise to education reformers"
"Clayton Christensen's advice has helped scores of major businesses. Here he applies to public education his theory about how organizations should respond to disruptive innovation... shows boards and superintendents why they, too, need to 'run two businesses in tandem,' and explains how they can do that." "Disrupting Class gets directly to the point of how $60 billion was spent over the last two decades putting computers and learning software in schools with no effect on student achievement. Christensen looks beyond public education in order to disrupt the system of schooling. The authors show how to create research in education that will lead to greater predictability. Disrupting Class concisely explains how to create learning organizations needed for future generations." "As a former education policymaker and a continued advisor to education companies, I have felt – like many – frustrated by the seeming intractable challenges in transforming our public schools. This book tackles that frustration and proposes a road map and sound advice for how educators and policy makers can leverage innovation to achieve excellence in our schools."